Revision 2 of the Minitaur software adds 100 on-board patch memory locations, independent decay and release controls, and CV to MIDI conversion. "It is very simple, it took me ca. 5 minutes to explore all the sound possbilities. The sound is very soft like butter, and very fat. It can sound fat even without delay or reverb, and I have never experienced that when I have tried little phatty in the shop. And it has got the moog sound I searched for, and never found in the Phatty. The brightness is still not as crisp as my softsynths, it is actually duller, but they say it is the brightest of the new moogs. From listening to Automatic Gainsay's videos I would say that Minibrute has crisper and more raspy oscillator. The Minitaur oscillator is more polite. I disagree with the resonance level scaling. It seems to be linear, so the sound start to fade away as soon as I start to add resonance. I would have liked a more inv. exp curve compensation system. You actually have to increase volume when you add a little bit of resonance. 'The resonance self oscillation is like a very pure sine wave that do not blend with the sound, but is like a sine wave on top of the sound. It is totally different from the MS20, Minibrute and Monotribe that screams like crazy when you add resonance. The resonance on Minitaur is very , very polite. Actually I prefer the sound with no resonance, there is no magic to the sound when I add resonance, the sound seems to become weaker and less powerful. The env is perfect and very musical. And very snappy. The most agressive tones, that still is quite polite, can be had with short snappy enveloes. Wish list: The synth would have been so much more versatile with Pulse width modulation, or even fixed puse-width settings. Fixed pulse values like the Minimoog had made a big selection of reedy leadsounds possible. 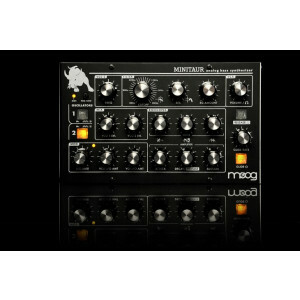 So it is very limited and polite, but it has got that moog sound that I love. This unit is not for users that are not players, and like to sequence and make crazy effects, and like the resonance to scream. It is a polite very fat synth with a classic buttery soft sound and is a champion on simple fat sounds and bass. It sounds very good for soft lead sounds. " Caution: Speaker damage, structural damage to buildings, and personal injury are all possible using the MINITAUR Analog Bass Synthesizer at high volumes.